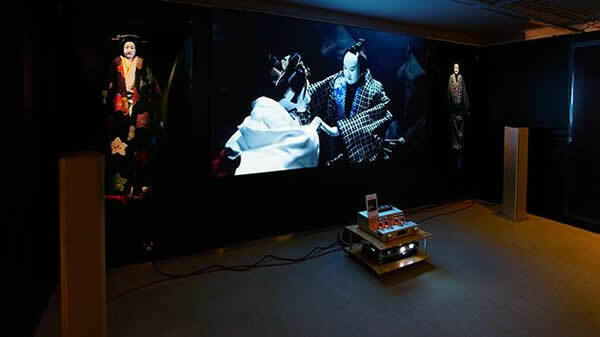 Blackmagic Design has announced that photographer Hajime Watanabe and film director Koshi Horibe used the Blackmagic Design HyperDeck Studio Pro for the ”Bunraku Human/Puppet Photo+Movie Exhibition,” held at Tokyo’s Omotesando Gallery 5610 from February 25th to March 9th 2013. Bunraku is a traditional Japanese puppet theater, and Watanabe and Horibe collaborated using the latest technology in video and photography to interpret the ancient art form. With the help of puppeteer Minosuke Yoshida, the two artists shot the performance in a studio with Ultra HD high speed RED EPIC and Panasonic A3DA1 stereo 3D cameras. The puppets’ expressions and subtle movements were captured from various angles, creating a visual experience that would not have been possible in a traditional theater setting due to the incredible detail, depth and clarity of the Ultra HD images. One of the challenges the Watanabe/Horibe team had with the project was being able to provide astonishing high quality image output within a limited budget. They chose Blackmagic Design’s HyperDeck Studio Pro for 4K video playback, and paired it with a Sony 4K Projector. This combination provided a cost effective and spectacular Ultra HD experience and the exhibition proved extremely popular, drawing more than 2,500 visitors in 13 days. For the exhibition, Ultra HD footage was recorded onto SSDs, then played back via the HyperDeck Studio Pro connected to a Sony 4K projector. Audio was sent to a sound playback system via the HyperDeck Studio Pro’s balanced line level XLR outputs. The simple setup meant all the exhibition staff had to do was turn on Hyper Deck Studio Pro, insert the SSD and press play. Powering the projector, audio equipment and HyperDeck Studio Pro to screen the video was a quick process, and the HyperDeck Studio Pro played back the Ultra HD video all day.